We've been excited to post this how-to all week. It's so Mad Men meets Martha Stewart in a good way. 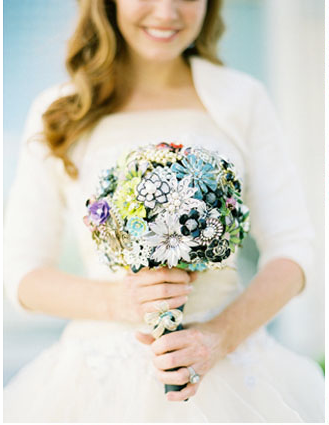 The FG's are in frenzy for the latest bridal trend — a bouquet made entirely of vintage brooches. Half the fun is plucking them from grandma's jewelry box, flea markets, and antique stores. - Decide on a color scheme of 3 to 5 colors and stick to it. - The finish on your brooches should match, so pick one metal. - Find brooches in a variety of sizes. - Pick pieces that mean something to you whether they are heirlooms or adorned with a symbol that holds meaning to you. If you have one piece that is especially close to your heart, let it inspire your color scheme. - Sparkle is more important than the cost of the piece. You don't want to be throwing a pricey piece up in the air and into the arms of another girl. This Style Me Pretty Bride chose a blue color scheme. Note the variety of brooches, but the coordinating colors and matching metals. Directions: We spotted these steps on Fancy Pants Weddings, and couldn't really have written them better —but we did add a few FG tips and tricks, of course. Attach wire to your jewelry pieces. Since each brooch will be different you will need to alter technique for each piece. Keep this in mind: the heavier the piece, the more wire you will need. The key is avoid drooping wire when you hold the brooch between two fingers. Otherwise, your bouquet will droop at the end. 2.) Next, twirl the corsage tape down the wire pulling as you go. Gently pulled and is overlapping itself. This will take some practice. Remember the wire and taped brooch should be sturdy. Be patient and take your time on this step. 3.) Time to assemble. Pick up the hydrangeas in your left hand. Start to insert your wired jewels one at a time. The hydrangeas will cover the all the wire and be completely covered at the end of your project. Look at you go, little Martha Stewart. Now, make sure you rotate the bouquet as you insert your brooches. You want to create a dome. 4.) Almost there, once your satisfied with the look, gather the ends of your wires together tightly. Then pick up your corsage tape, and wrap it around the ends to create the handle. Now, for adorning the handle, there are always options on how to wrap your handle: twine, gemstones, or even adding a full collar. We will let you imagination roam with that idea. After all, it's your day. 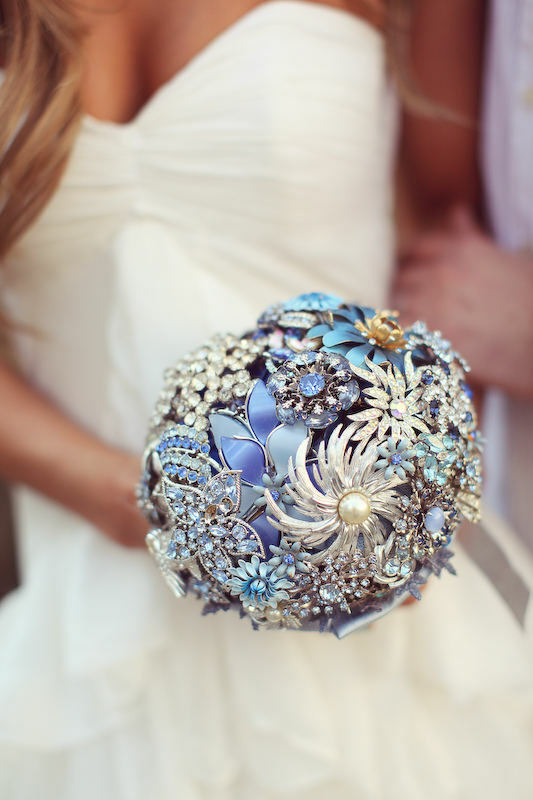 We've given you the steps, now, tell us who is planning to make a brooch bouquet for their big day?